Student-Staff Partnership Projects within the Teaching & Learning Stream seek to enhance curriculum content, design and facilitation. Students Partners as Pedagogical Consultants or Advisors on courses. Students and Staff generate feedback with students within that course, conducting observations of teaching and collaborating to enhance, innovate, or co-create curriculum. Student and Staff Partners as Course Co-designers. Students and Staff collaborate on course design / development including the creation of interactive content, innovative assessment or learning activities. Student and Staff Partners collaboratively integrating high-quality, learner-centred and inclusive course content and materials online, as part of the UQ2U initiative. To find out more about UQ2U, visit the website here. This Student-Staff-Partnership (SSP) project involved the revitalisation of an introductory course to second language learning and teaching (SLAT2001/7001), offered in a flipped mode for the first time in Semester 1, 2018. This included revising the assessment tasks to make them more authentic and relevant to students’ needs, and improving the quality of video lectures and enhancing the effectiveness of technological tools used for in-class activities. To achieve the partnership project aims, the team followed a four-stage framework (Reflection – Planning for improvement – Implementation – Evaluation) that allowed for maximisation of student input, staff guidance, and student-staff discussion. In Stage 1, student partners wrote reflections considering the strengths and weaknesses of the course assessments and use of technology. For Stage 2 and 3, student partners worked in groups under the guidance of a staff member to draft a detailed plan for improvement and implemented the planned changes. In Stage 4, both students and staff evaluated and provided feedback on the project outcomes: (1) a revised assessment plan; (2) student-developed video lectures; (3) list of technological tools and how they can be used in the course. Each stage was concluded by a group meeting where progress was reported and evaluated. Throughout these stages, we utilised several online platforms such as Google Docs and Padlet for student and staff partners to share their input and provide feedback, while our group meetings were operated on the principles of mutual respect, reciprocity and responsibility. The outputs of our project can be divided into two important parts: (1) the process and (2) the end product. Regarding the process, our exchange of feedback allowed us to co-construct knowledge through a shared learning environment, which benefitted both the students and the staff involved. While the student partners were able to acquire important skills for their future career through a critical analysis of their own learning process, the staff partners were able to improve their teaching practices as they learned from the students’ experiences and expectations. In terms of the end product, not only were materials revised but also ideas on how to implement these materials throughout the course are the results of the process mentioned above. The revised materials comprised (1) redesigned assessments that match with the course aims and help students to progress through the course content and; (2) redesigned online materials, especially video lectures, to be more engaging and enhance the content understanding as well as the flipped classroom experience. The partnership project enabled us to gain greater understandings about how to give appropriate feedback and cooperate with others to achieve a common objective. This included how we use language to show mutual respect, engagement and a shared-learning attitude. The most important thing we learned about working in a partnership is the development and implementation of mutual respect, especially in the case of a staff-student organised group. Respect that staff had for student input and feedback, and the respect that students had for staff input and feedback. The development of respect allowed for ease of feedback, aided in critical analysis of problems we had to solve. This improved the entire group experience as a whole as everyone felt comfortable in sharing their thoughts and ideas. This partnership project provided a valuable opportunity to collaborate with student partners who we had not had the opportunity to work with prior to this experience. This engagement expanded our perspective in terms of how to collaborate and how to achieve common goals despite differences in backgrounds and experiences. The student partners were in the position to provide valuable insights into several aspects of the course that required revision, especially in terms of their reflections as a result of their past participation in the course. It was very refreshing and inspiring for us to examine and revise the course from the students’ perspective. Establish clear objectives and outcomes from the beginning of the project and make sure that these are understood and agreed upon by all project members. Take the time to listen to everyone's input at the very start (e.g., through an individual reflection task). This allows students a chance to voice their opinions without fear of harsh criticism and helps to promote a safer-feeling environment which all group members are more open to share in. Tasks should be allocated according to each member’s strengths, while everyone is encouraged to provide feedback and help each other. Regular meetings are important to keep track of progress. Online tools (e.g., Google docs, Padlet, etc.) are effective to maintain group communication. Decisions central to the project’s development should be discussed and then jointly made, so that all team members could share a feeling of ownership and understand how important their contribution is. Sharing experiences with other Partnership teams (e.g., through SSP Showcase events) helps to enhance the opportunity of self-reflection and evaluation. 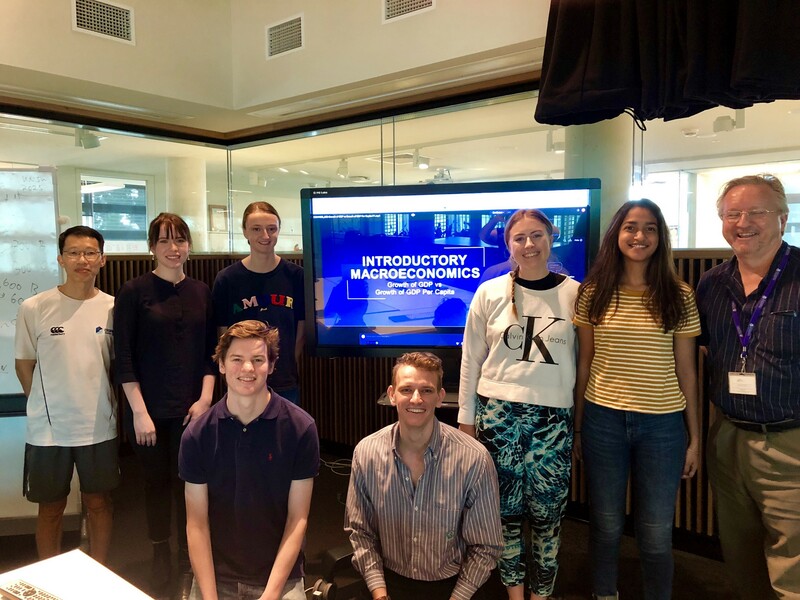 This Student-Staff-Partnership (SSP) project is part of a blended learning project for ECON1020 Introductory Macroeconomics under the UQ2U program. The blended learning project aims to redesign the course to improve students’ online as well as offline learning experience. The SSP project aims to seek student direct input in the redesign and production processes. We consulted widely regarding the redesign of the course and its assessment scheme, including student partners, learning designers at the BEL Faculty, and other academics who have experience in blended learning. Student partners were recruited from diverse backgrounds, and year levels, to ensure that the redesigned resources would cater for a wide range of students undertaking ECON1020. All team members, including student partners were provided training on video script-writing and production. Using those skills, student partners interpreted content from previous years lectures, then wrote ‘storyboards’ in their own words to explain the content to other students. These storyboards then formed the basis for the videos, with all students partners participating in filming. These videos will be the core of a series of online lecture videos to be rolled out in Semester 2, 2019. At the time of writing, the blended learning project is still continuing. For the duration of the Student-Staff-Partnership Project, the student partners co-developed videos for 4 weeks of lecture content. In doing so, they have merged and converted lecture notes from two different instructors from two previous semesters into coherent online lecture materials, and created the in-person recordings as well as tablet recording. Importantly, student partners also contributed to the overall design of the blended learning course, such as the assessment design and supplementary material on the Edge platform. Through the student partnership pathway, members of the student partner team have been provided with employment opportunities to collaborate on the redesign of the project in an ongoing basis and see its implementation in 2019. Having the direct input from students in course design has helped to ensure the content are relevant from students’ perspective. In particular, student partners have not only informed me what knowledge is essential for those who will continue to study intermediate macroeconomics, but also convinced me the most appropriate way to assess students’ understanding of the related materials. Having a diverse team of students allowed for broad perspectives in all stages of the production process. The combination of student partners with different qualifications as well as familiarity with the course ensured the content was targeted at students from multiple backgrounds and perspectives. With different schedules and shifting availability, weekly meetings, and independent or paired group work was essential in constructing the new model for ECON1020. Giving student partners the opportunity to write, then present content also allowed a sense of continuity with the blended learning redesign. Key takeaways for other student partner projects are to meet frequently, work in small, diverse teams, and allow students to set the schedule and weekly activities, so there is natural buy-in to the project’s goals! Course coordinator has to work as the gate-keeper to ensure the accuracy and quality of the content.